Moroccan police violently dispersed a protest by separatists in the Western Sahara, Algerian TV and rights activists reported on Monday, during a visit to the disputed territory by UN envoy Christopher Ross. The independent Ennahar TV channel broadcast images of plainclothes Moroccan police beating Sahrawi men and women in Laayoune, chasing them through the streets and dragging some of them along the ground. This entry was posted in Human Rights, Political issues on March 31, 2013 by appleton. Video of Moroccan secret police beating and harassing Saharawis during the visit of UN Secretary General Special Envoy Christopher to occupied Western Sahara 21 to 24 March 2013. 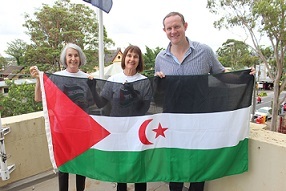 On Tuesday 5 March Leichhardt Municipal Council raised the flag of Western Sahara to mark the anniversary of the Saharawi Republic on the 27 February, the Saharawi National Day. The flag was raised by Councillor Darcy Byrne, Mayor , Leichhardt Municipal Council. 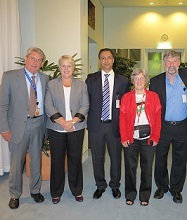 Members of Australia Western Sahara Association (AWSA) attended the informal ceremony when the Mayor raised the flag. This entry was posted in Political issues on March 30, 2013 by appleton. Melbourne Weekly Times, March 4, 2013, 10:53 a.m.
A PUSH to celebrate cultural diversity by flying other nations’ flags within the Moreland City Council has been stymied. Last month the council staged a small celebration to mark Western Sahara’s national day, but did not fly the flag outside Coburg Town Hall. The gesture was a compromise, after a motion put forward by Moreland councillor Lita Gillies to fly the Western Saharan flag raised objections. This entry was posted in General, Political issues on March 30, 2013 by appleton. (ANSAmed) – STRASBOURG, MARCH 12 – The Western Sahara House Intergroup on Tuesday called on European Parliament President Martin Schulz to condemn Morocco’s March 6 expulsion of four MEPs. Moroccan authorities expelled Slovenian liberal Ivo Vaigl, leftist Spaniards Vicent Ramon Garces and Willy Meyer, and Swedish People’s Party MEP Isabella Lovin from Casablanca airport, preventing their mission to the Western Sahara, where they were to meet with local representatives. This entry was posted in Human Rights, Political issues on March 17, 2013 by appleton. Moroccan Permanent Representative to the United Nations, Mr. Mohammed Loulichki, responds to a documentary “Sons of the Clouds – The Last Colony”, presented by award-winning Spanish actor Javier Bardem about the conflict over Western Sahara, the last remaining colony in Africa. This entry was posted in General, Human Rights, Political issues on March 17, 2013 by appleton. Tuesday 12 March 2013, Parliament House, CanberraThe Australian Parliamentary Friends of Western Sahara organised an event in support of Western Sahara at the Federal Parliament on 12 March 2012. The event included a special screening of “Sons of the Clouds – The Last Colony”, a documentary presented by award-winning Spanish actor Javier Bardem about the conflict over Western Sahara, the last remaining colony in Africa. “Tonight, in the name of Western Sahara, we welcome diplomats, parliamentarians and the press to our film viewing. This entry was posted in Human Rights, Political issues on March 14, 2013 by appleton. Konstantina Isidora, editor of Pambazuka Press, has brought together a brilliant collection of perspectives on WS. Her own article “Another Moroccan ‘coup de théâtre’” on the Gdeim Izik trial incisively brings together all aspects of the trial and the injustices meted out to the Saharawi prisoners. This entry was posted in Human Rights, Political issues on March 5, 2013 by appleton. This entry was posted in Human Rights, Political issues on March 4, 2013 by appleton. (Feb. 28, 2013 – Brussels) Today, Santiago A. Canton, Director of RFK Partners for Human Rights, testified before the European Parliament on the findings of the Robert F. Kennedy Center for Justice & Human Rights (RFK Center) international human rights delegation to Western Sahara and the Sahrawi refugee camps in Tindouf, Algeria. Kerry Kennedy, President of the RFK Center, led the delegation in August 2012, and Mr. Canton was invited to present the findings of the delegation by the Honorable Norbert Neuser and the Intergroup on Western Sahara.